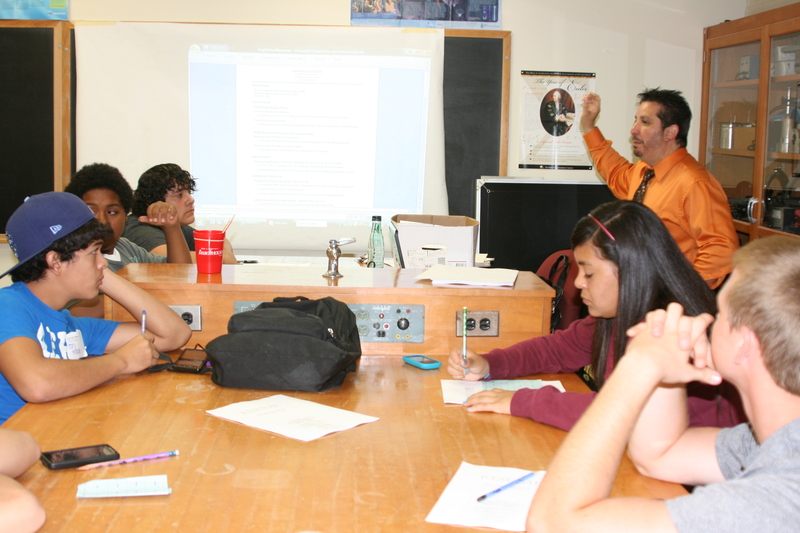 Geno Vargas of Workforce Solutions of the Coastal Bend works with a youth group on building a solid resume. “We wanted youth to know that soft skills are important,” Scotty Draper said about the recent Tools for Tomorrow Youth Conference held in Beeville. More than 70 Coastal Bend College TRiO students from Beeville, George West, Odem, Sinton, Taft, Karnes City, Kenedy, Mathis, Odem, Pettus, Refugio, Runge, Skidmore, Taft and Three Rivers attended the daylong event. Draper and Lisa DelBosque co-chaired the event and worked with other graduates of the Critical Thinking in Leadership 2011 Class. Tristen Martinez, Belinda Flores and Mark Jaffrion of Beeville; and Sue Ellen Brown and Christi Mascarro of Refugio combined their expertise and leadership skills to put together an event that benefitted area youth. They created the conference as a Leadership group project to introduce teenagers to the “need to know skills” they’ll have to have for college and the workforce. The conference started out with guest speaker Geno Vargas of Workforce Solutions. His message, “You’re the BEST,” resonated with the participants. Break out sessions followed, addressing issues like how to dress, how to interview, writing resumes and managing money. Vargas worked with participants on resume construction and Refugio County Treasurer Louise Addull worked with them on answering interview questions. The event wrapped up with a career/job fair where participants were able to talk to professionals and learn about career opportunities. Career/job fair presenters included: Mary Reyes, Coastal Bend College and Beeville Independent School District CNA Program; Estevan Vasquez, CBC Athletic Coordinator and head softball coach; Elizabeth Shelton, DDS, Bee Center for Dentistry; Jessica Valdez, dental hygienist, Bee Center for Dentistry; Martha Warner, district attorney, 156th Judicial District; Chris McDonald, game warden, State of Texas; Chris Priddy, HEB Central Checkout Operations Manager; Raymond Carolan, CBC Aviation Technology Instructor; Roy Coley, CBC Oil & Gas Technology Instructor; Bob Roberts, CBC Division Chair for Technology; Mark Joffrion, MT (ASCP), lab manager, Christus Spohn Hospital; Patsy Echavarry, community education coordinator, Exclusive Home Health & Hospice, Inc.; Patrol Sergeant Ronnie Jones, Bee Co. Sheriff’s Office; Patrol Deputy, J.D. Aguirre, Bee Co. Sheriff’s Office; Perry Langbein, Perry Langbein Photography; Jennifer McCall, writer; Larry Wren, RN, Director of Business Development, Exclusive Home Health & Hospice, Inc.; Taliesin McCall, English teacher, A.C. Jones High School; Michael J. Alvarez, P.E. transportation engineer, Texas Department of Transportation; Mitzie Gibson, construction record keeper, Texas Department of Transportation; Rachel Hensch, DVM, Beeville Veterinary Hospital; Rachel Flores, personnel manager, Wal-Mart Supercenter; Matt Reidy, wildlife biologist, Texas Parks & Wildlife Department; Patricia Lucio, business service representative, Workforce Solutions of the Coastal Bend; Stephanie Salinas, youth career counselor, Workforce Solutions of the Coastal Bend. Mike Stone of Sonic, America’s Drive-In, provided coupons for students who attended the event.